Insert DXF or DWG files into a sketch as sketch entities. The DXF or DWG must have already been imported into the currently open document (or another document you own or that has been shared with you, creating a link to that document). It is recommended that you insert DXF or DWG files into an empty sketch, though it is possible to insert into a sketch with existing sketch entities. All Onshape supported formats can be found here. Click to create a new sketch. Then select a DXF or DWG file (that has been previously imported in the current document or use Browse documents to locate a file in another document that you have created or that has been shared with you). Selecting the file to insert automatically closes the dialog. You are able to insert DXF/DWG files that have already been imported into your document or another document that you have created or has been shared with you. These show up as tabs and also in the Insert DXF dialog. Make sure to select the units in the dialog first; selecting the file automatically closes the dialog. The Insert action is recorded in the Undo/Redo stack for the document. When dimensioning the inserted sketch, the first dimension applied automatically scales the entire sketch. If some geometry in the inserted sketch isn't supported, Onshape inserts the supported geometry and displays a message about unsupported geometry not being shown. Tap the New sketch tool to create a new sketch. 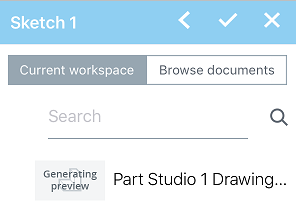 in the dialog that appears, select a drawing from either your current workspace, or browser other documents. You are also able to search for a drawing by name. Tap to select the drawing you want to insert. Tap on the blue unit to select units.